So, the other week I blogged about my morning skincare routine, and now i'm finishing it up with my evening skincare routine. I do have a 'Skincare Products I Use Occasionally' post scheduled too. I do use a lot of different products on my skin at the minute, but they're mainly for different things and all seem to help in their own way! These are products I use mostly every day, but sometimes I get lazy and omit one or two products from my routine. I start by applying Soap and Glory's Drama Clean micellar cleansing water to a cotton pad or two, to gently swipe them over my eyes and remove any mascara. Micellar waters are meant to 'magnetise' make-up, dirt and dead cells away and are to be used without rubbing-I do have to rub a little, as i've started using waterproof mascara to stop it from smudging throughout the day. It is a 5-in-1 cleansing water, that you do not need to rinse, it's oil-free, non-drying, and removes face and eye-makeup. I then use No7's Beautiful Skin quick thinking wipes to remove foundation, concealer, and any moisturising cream left on my face from the day. These are my favourite face wipes, as they are thick, not too wet or dry, remove my makeup well, and the packaging has a resealable lid to keep them moist. The wipes are fragrance free, and contain pro-vitamin B5 to moisturise and soften, and traces of witch hazel and fennel to clear pores and leave your skin feeling soft. Boots' Tea Tree and Witch Hazel exfoliating pads are another product I use daily, these are formulated with antibacterial tea tree oil, and skin calming witch hazel to keep your skin clear and healthy. The pads are great for smoothing the skins surface, unblocking pores of dirt, oil, and grease, and to fight spot-causing bacteria. I use mine to even out my skintone. 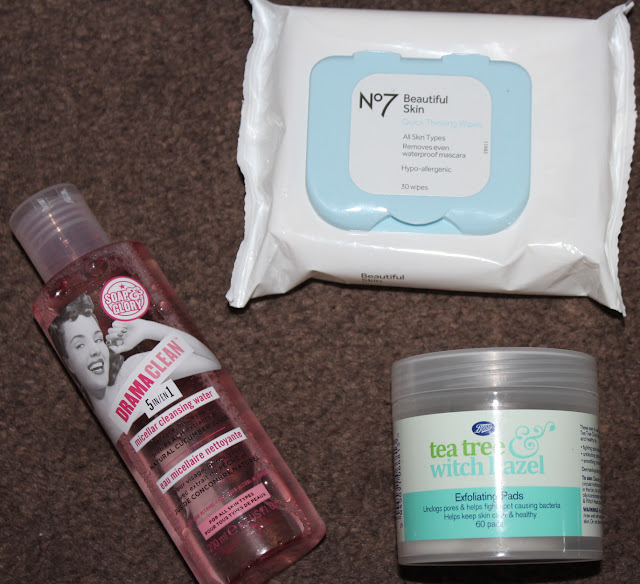 The next step in my evening skincare routine is cleansing, I currently use my Soap and Glory Peaches and Clean cleansing milk with my No7 Beautiful Skin cleansing brush. The Soap and Glory cleansing milk is excellent, it's non-drying, and removes make-up. It helps to soften, purify, and invigorate skin, whilst smoothing out impurities. I've found it to be the best cleanser, and has a lovely scent. It doesn't leave my skin feeling tight, like the Simple ones used to, and it's not sticky like others i've tried. I use it to remove any last traces of makeup that I may have missed with my wipe. I seem to have ended up with quite a few of these from gift sets that i'm trying to work my way through. The No7 cleansing brush, is a great cleansing brush for first timers that don't want to shed out a lot of money before knowing whether they can commit to the routine of using a cleansing brush regularly, or if it'll help their skin. I love this brush, and with my work discount, I got it at a significantly lower price which swayed me, i've just bought the Magnitone Pulsar off of my Boots points, so i'll see if there is a difference in the results. I think the added use of a cleansing brush to apply and rub in my cleanser is great, and very effective. It gently exfoliates and deeply cleanses the skin; removing more dirt, oil, and make-up than manual cleansing alone. I use the second setting for a deeper cleanse, and tend to use it for about 30 seconds. Since using it, my skin has been a lot softer, and i've noticed a significant improvement in my skin tone. The third step in my daily night routine is toning. I start off by using Botanics 100% Organic Rosewater toning spritz, I think this toning water is great for easy and quick application since it's a spray, rather than a liquid that needs to be poured onto cotton pads, etc. Rosewater is pretty great to refresh my skin, and revitalise me though. It's used to tighten pores, and remove any last traces of makeup. It doesn't add excess oil, and visibly reduces the size of my pores and spots. It smells like mosquito repellant, and I think it's pretty pricey for what it is-I won't be re-buying it, if I replace it, i'll just buy cheap rosewater. 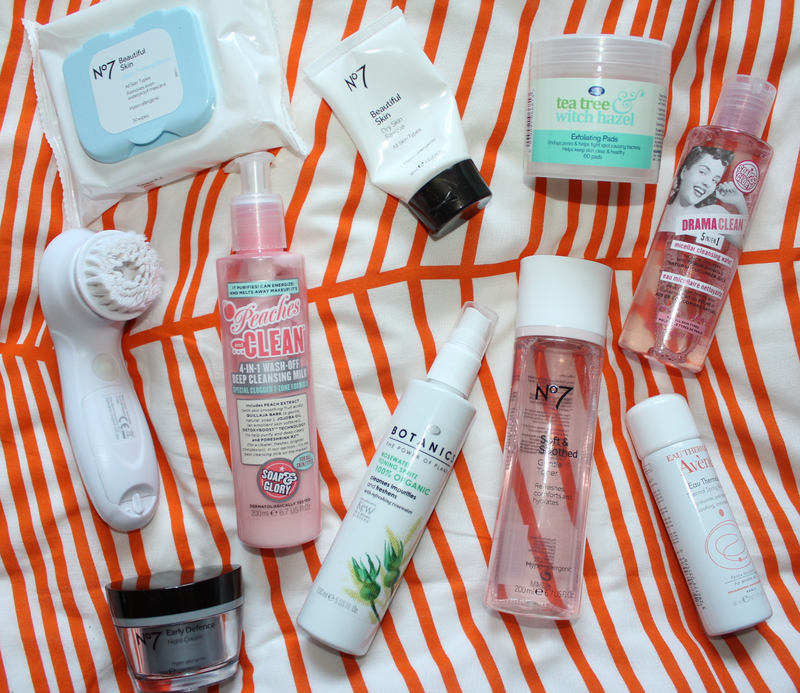 Check out the other Botanics products I use, in my Morning Skincare Routine. Or I use the No7 Soft and Soothed gentle toner, which is supposed to comfort and hydrate-I don't really find it hydrating, as it slightly dries my skin out. It definitely tightens my pores, and evens out my skin tone. 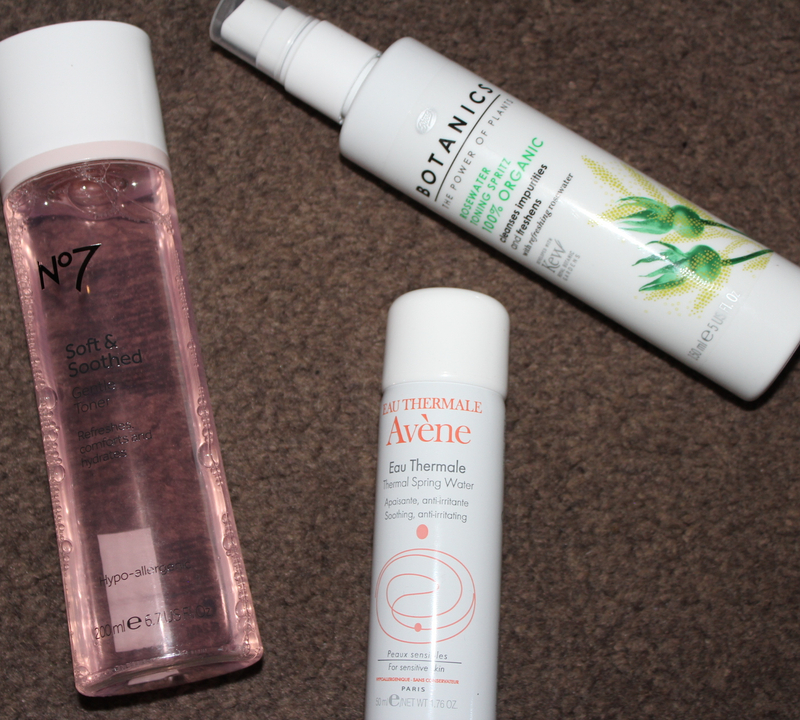 As I mentioned in my May Favourites, I love Eau Thermale Avene's thermal spring water. I had an allergic reaction the other week, and after spraying this product over the reaction, it cleared up super fast, and removed any redness and itchiness. I also use this product on little spots, and redness I have on my arms, which has evened my arms skin tone out so fast-works better than Bio Oil, and isn't oily. The Thermal Spring Water has many other uses, for example, it can also help to sooth sensitive, hypersensitive, allergic, and irritated skin; soothing sunburn, razor burn, diaper rash, etc. and can also help to set make-up, cool you down after physical activity, and when travelling. I finish off my evening skincare routine with moisturising, to keep my skin feeling hydrated and fresh throughout the night, and allows me to wake up without a dry face. I use the No7 Dry Skin Rescue, which is a thick balm that leaves my skin feeling intensely hydrated, and revived. It soothes any dryness, burning, itchiness that has been left on my skin. Read more about my thoughts on it, in my Morning Skincare Routine post. It also helps soothe sunburn, etc. The last product I use in my evening skincare routine, is a great moisturiser. 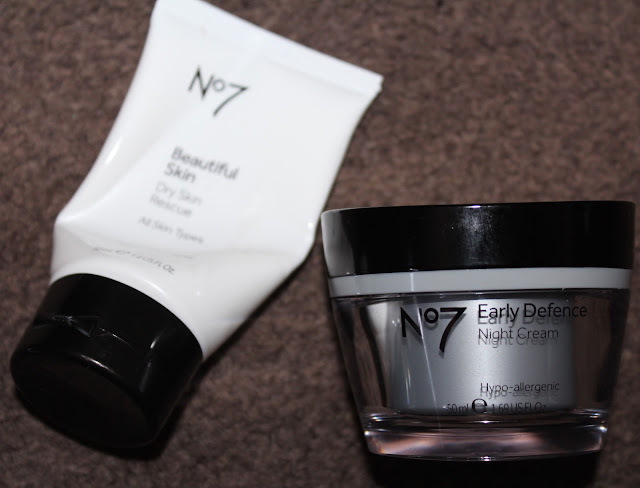 I'm currently using the No7 Early Defence night cream, that goes with the day cream i'm currently using and blogged about previously, here. This is a super light, great smelling, hydrating night cream which is excellent for the summer months. My skin definitely looks fresher, cleaner, and feels more moisturised and softer after use. What products do you use in your evening skincare routine? Do you use any of these?